'What's Your Question' is a free, printable critical thinking worksheet for 3rd grade. 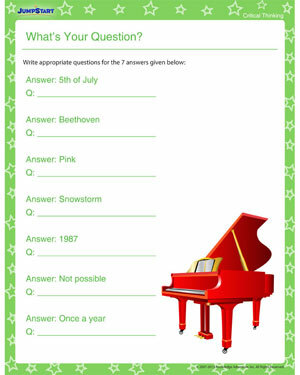 This worksheet urges third graders to think relevant questions for the 7 seven answers given. As kids read the answers, they will be motivated to use their general knowledge and critical thinking skills, merge them and come up with questions for which the answers will be a right fit. This activity of finding questions for answers instead of it being the other way round will appease the curiosity that is common to most 3rd graders. Check out more such free critical thinking printables for kids now!